I do not recall hearing this much chatter about the CAUCUS in IOWA, during previous elections, so I decided to do some research. I'm sure many of you are already on point with your CAUCUS knowledge, but for those who really need to know, or need a refresher, I've done some googling and posting for you. The word caucus is a North American Indian word, thought to be of Algonquin origin, meaning a gathering of the ruling tribal chiefs. The modern definition describes caucuses as a process of political party members gathering to make policy decisions and to select candidates. When is the 2008 Iowa Caucus? 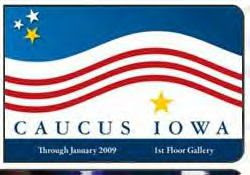 The 2008 Iowa Caucus will be held January 3, 2008, at precincts across Iowa. To find your caucus location, call the Iowa Democratic Party or the Republican Party of Iowa. How did the caucuses begin? Some form of caucus has existed since the early 1800s, even before Iowa became a state in 1846. Developing from the congressional and legislative caucuses, the pioneers of the Iowa constitution chose caucuses rather than a primary to nominate candidates, preferring the grass-roots democracy-in-action approach. The caucuses are held in Iowa every two years. The caucuses held in the off-presidential years are usually smaller and focus on the party platform. The caucuses that coincide with presidential elections are better attended and receive more media attention. Who participates in the caucuses? Any voter who is a registered Republican or Democrat, and can prove residency in Iowa, can participate in the caucus of their party.